35 Yards Out | Where the view is always better. With less than 24 hours to go (and less than 12 hours in Europe) to a midnight launch, those who have pre-purchased Mists of Pandaria will want to go over their final preparations for exploring the continent of Pandaria. Tips are already abound from the blogosphere, such as this one from Tabana at the WoW Hunters Hall. Frostheim also recently wrote up an overview of hunter leveling to 90. If you are still looking for more tips to make your hunter’s midnight launch go smoothly, use this brief checklist as well. Bring one or two pets with you only. While it may be tempting to bring five pets in your immediate stable to be able to use stampede as soon as it becomes available, Pandaria has a whole slew of new pets and models to tame. This will enable you to immediately start tracking the new rare pets if you come across their tracks instead of figuring out later which pet you want to abandon. If you are only bringing one pet, take one that can be multipurpose for DPS in dungeons and tanking for solo questing. Otherwise you can bring a dedicated ferocity and a dedicated tenacity pet. Check your talents. Many testers have already said that the three specializations don’t make a difference during leveling, so choose one that comes to you naturally. Pick up talents that you think will be useful for your own leveling method. I will be leveling as Marksmanship. Toggle Trap Launcher on. You may have noticed this in the weeks since Patch 5.0.4 rolled out, but Trap Launcher can now be permanently toggled on such that you do not to click the ability every time you want to launch a new trap. If you haven’t already done so, now will be a good time to begin getting used to using it for easy access during leveling. Are you doing anything special to prepare for your midnight launch? Just over a week ago the video above appeared on YouTube showing Lazyguide of Ner’zhul pet tanking 10-man Heroic Morchok. I already had an inkling this is possible after the Warcraft Hunters Union on Icecrown took down Morchok on normal mode with a 10-man hunter group in July, but I never researched it any further at the time. Our kill took five attempts or so after playing around with group arrangements and positioning and improvising pulling strategies, but it was successful. With one lockout remaining before Dragon Soul is no longer considered “current”, this guide should help anyone wants to try out this encounter for the final week of Cataclysm. You do not have to choose the Beast Mastery specialization to tank Heroic Morchok. I personally pet-tanked with a Marksmanship specialization because I can use the hard-hitting combination of Aimed Shot and Chimera Shot to generate more Misdirection threat to my pet. Although all pets can now be a tenacity pet, I would still recommend using a turtle or a beetle because of their respective abilities Shell Shield and Harden Carapace, which can reduce damage taken by 50 percent for 12 seconds. If you would like to create a safety margin for your pet’s health, bringing along a Flask of Steelskin might not be a bad idea. This encounter can be done with two or three healers, depending on how comfortable your healers are with healing your pet. You will want an additional tank to pick up Morchok’s twin Kohcrom. The pet should make the initial pull with Misdirection from the hunter. The other tank should not use taunt abilities for the first phase of the fight. This is because once Morchok splits into two, he seems to maintain the aggro table from the first phase. We would like to avoid an accident where the other tank finds himself tanking Kohcrom and Morchok at the same time. 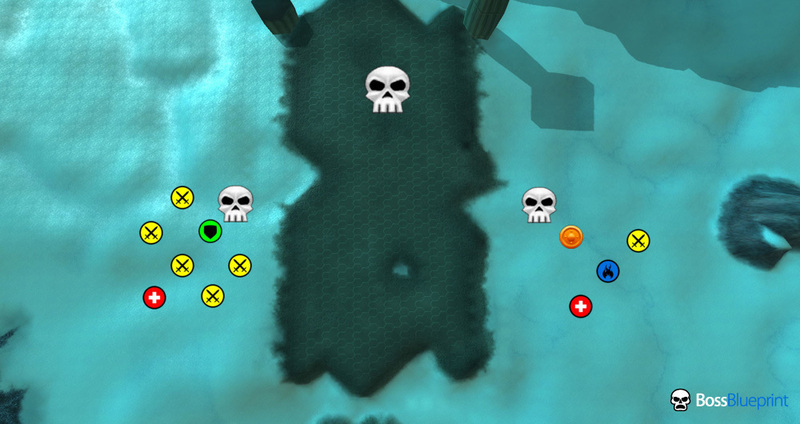 Because Morchok splits to the right, the hunter (blue circle in the blueprint above, with the pet marked in orange) should be positioned to the group on the right. One healer should be assigned to each group. The third person in the hunter group can be another healer or a DPS which can drop his own aggro table (I will explain why later). Once the other tank has stabilized Kohcrom’s position, the remainder of the encounter can now begin. Stomp does not affect the hunter pet, thus it can be entirely avoided with everyone in the hunter group staying at least 25 yards away from Morchok. Additionally, with more people on the left group, the damage from Stomp can be split across more people. The tricky portion of the encounter begins when Morchok and Kohcrom draws everyone in with Earthen Vortex. When this happens, the hunter pet appears to despawn and drop all aggro from the boss, thus prompt reapplication of Misdirection toward the pet is necessary. This is when the other DPS with the hunter should use his aggro reset ability to make it easier for the hunter pet to regain aggro. Not doing so may result in chaos. Pets are also not affected by Black Blood of the Earth, so send it toward Morchok immediately after Earthen Vortex is over. This and prompt reapplication of Misdirection will help the pet gain aggro quicker. Once Black Blood of the Earth is over, the encounter repeats itself. As long as no one in the hunter group is within range of Morchok to take damage from Stomp, the encounter should go on without a problem. Occasionally you may find that Resonating Crystal is placed within the Stomp range. If that is the case, you will want to either reposition your pet quickly or stay away from the Resonating Crystal until after Stomp has finished casting. It is theoretically possible for two hunters to individually pet tank Morchok and Kohcrom if Kohcrom can be immediately picked up once he is summoned. Because their mechanics are identical, it might also be possible for a 10-man all-hunter group to defeat the encounter using the principles I described above. If an all-hunter group is not possible, bringing along two healers (one for each group) should suffice, with an even 5–5 group split between Morchok and Kohcrom. If you recently leveled leatherworking prior to Patch 5.0.4, you might want to check your recipe book again. About two months ago I decided to drop one of my two gathering professions for a crafting profession. I decided then to choose the standard skinning–leatherworking combination to benefit from the extra agility in the bracer enchant. However, I didn’t bother replacing [Dragonscale Leg Armor] with the leatherworking enchant because I had already been using the heroic Tier 13 leggings for quite some time. The enchant provided the same benefits of +190 Attack Power and +55 Critical Strike, so I skipped the extra effort and materials. When I checked after the patch, however, the leatherworking enchant had been converted to Primal Leg Reinforcements, which provides +95 Agility and +55 Critical Strike. On the surface, it looks equivalent to the old version because, for hunters, 1 Agility is equivalent to 2 Ranged Attack Power. However, the 95 Agility also provides some Critical Strike bonus, edging out the crafted leg armor in DPS value. So if you haven’t already, switch your leggings enchant now. It will only cost you an easily obtainable Eternium Thread. Patch 5.0.4 information is everywhere, and it’s nearly impossible to include everything, so I will point you to Battle.net and MMO-Champion for a top-down view. We have a month between patch 5.0.4 and Mists of Pandaria to analyze the effects of the new changes. I have never been an expert in analyzing things forward, so I will analyze what has already happened. How has Cataclysm been for hunters? RaidBots began collecting combat log data since the last days of patch 4.0.6. Unfortunately, we don’t have much perspective from the early days of Cataclysm, but this will suffice. From the data it collected, it is clear that Marksmanship dominated the combat logs for the majority of Cataclysm. It is also not a surprise for us now that Survival has been the dominant build on the raiding scene since Dragon Soul opened. 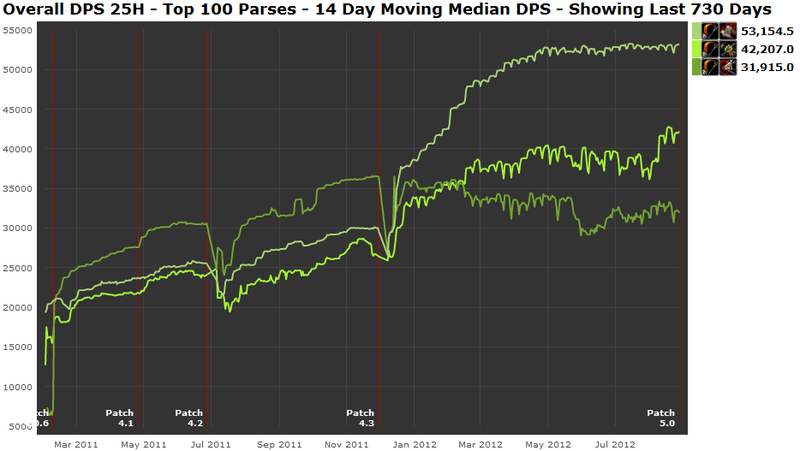 What is surprising to me is how wide the DPS gap has become over the patches. Balance is an abstract concept, but other patterns can point us to reasons why it is so hard to achieve. In an true environment of balanced talent builds, any hunter is free to choose his or her own build without impairing the ability to play the game. But what if that game is raiding? Then clearly a DPS gap indicates that the talent builds are in no way balanced. Moreover, a widening gap over a period of changes indicates that all attempts to balance the field have failed. Patch 4.2 was seen as the nail on the coffin for Beast Mastery. It made the build’s viability in raiding worse, and Beast Masters began thinking they have really been neglected. Their nominal DPS did not reach the patch 4.1 peak until it had passed the middle of 4.2. Marksmen and Survivalists continued their steady upward climb. I spoke about Survival’s silent comeback in patch 4.3 some time ago. It is obvious now that the comeback is not so silent. Survivalists came back with such a vengeance that the maximum hunter DPS was pushed higher until it reached a plateau of about 53,000. This is a 47 percent increase over the peak DPS in patch 4.2. No one would have foreseen in December. Marksmen, on the other hand, suffered terribly. Their numbers dwindled, and hunters began switching their talent builds to Survival in droves. In the end, their final nominal DPS was only slightly higher than the patch 4.1 peak. The surprise here is Beast Mastery. I had seen a small yet persistent group of Beast Mastery hunters continue with their talent build. They have continued against the odds and eventually overcame Marksmanship hunters in nominal DPS. The question, then, is what kept Beast Masters interested in their build that the Marksmen did not have in theirs? Back in November, I pointed to a blue post on the official forums which should have indicated that the three talent builds are balanced. The story of the past nine months, however, have indicated otherwise. Assuming that Blizzard was correct, what changed the mathematics? The answer should be player behavior. For reasons which I have yet to see articulated, hunters shunned the two talent builds which are not the top to a greater degree in patch 4.3. The fact that nominal DPS continued to rise steadily through patch 4.2 meant the ratio of players for each talent build and the rate at which they gained new gear remained constant. This status quo was thrown away when patch 4.3 arrived, and I have yet to rationalize how and why this happened. We can assume that Blizzard already has this data because it constantly monitors players’ progress in the game. They may already have the answer to this puzzle, and if they do, I hope they will attempt to prevent this from repeating in Mists of Pandaria.